Do you love the protection you get from your work boots but wish they didn’t come so far up your leg? These Ariat Men’s Edge LTE Moc in Dark Brown are a combination of a work boot and an Ariat Spitfire to give you the ultimate work boot package. 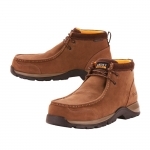 This style of work boot is the ideal choice for individuals who work both in an office and on the work site. They are 100% non-metallic construction with a lightweight stabilizing. 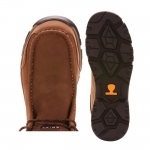 The heel of these work mocs is defined and combined with the oil-and slip-resisting outsole. Not only is the outsole oil-and slip resistant- but it also has passed the hot contact test up to 302 degrees Fahrenheit. These Ariat Work Boots can look the part in the office and keep your feet safe when on site!